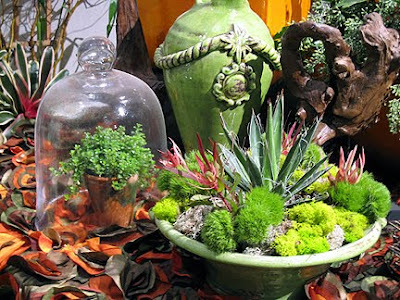 On Wednesday I met Mr. Brown Thumb (who hooked me up with a press pass) and Bintie (who has the coolest hair) at the Chicago Flower & Garden Show. Garden Girl was supposed to meet us, too, but wound up home sick instead, though she still graciously provided me with overnight lodging. You guys are the best! Here are my impressions of the show, in no particular order. Just get a littler clocher so we can chat as we go! Why are these people looking the other way, when there are brains on sticks and a disembodied tree hanging from the ceiling to be seen?! 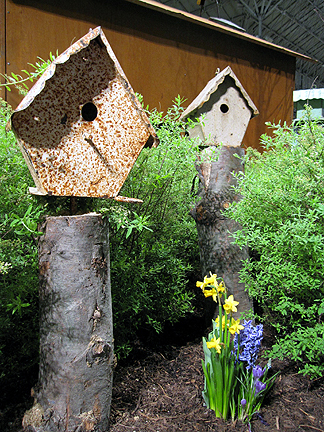 I really thought this was a great combo; the flowers really work with, and soften, the stark wood and stone. Something about these two lady slippers and their surroundings makes me feel like they're Muppet characters. A macro that actually worked. 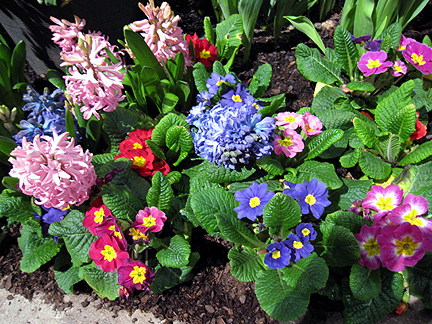 Spring, spring, spring, spring! Soak it up, take it in. 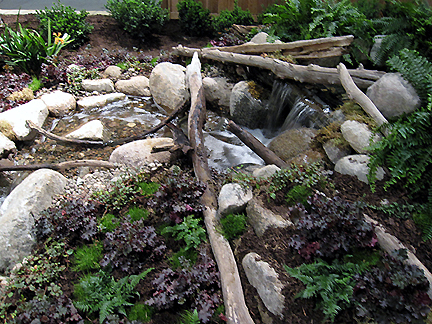 I love the pieces of wood which add a whole new dimension to this little waterfall. I love this use for an older bike. Yellow! When I had research colleagues who studied ergonomics, I learned that design features that help make something easier to use for a particular population (say, older people or people with limited eye sight) in general make the object easier for everyone to use. 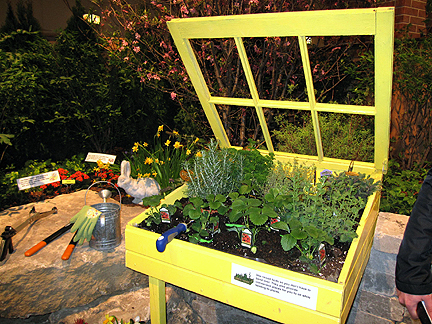 This wonderful cold frame, raised to a comfortable standing height is a case in point. 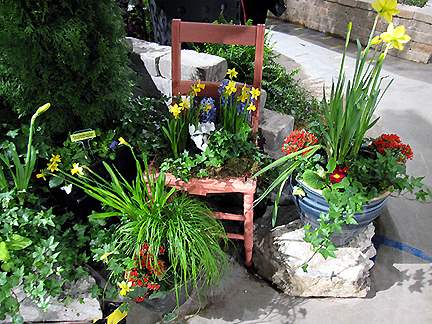 Not only does it make gardening possible for those who can't easily bend down, it's easier for everyone! 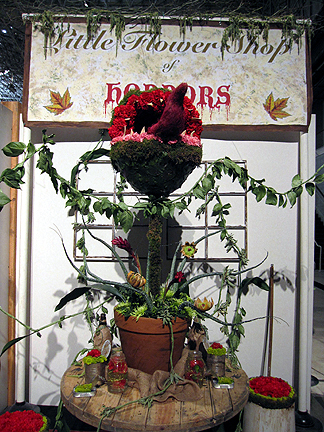 My favorite display in the show. 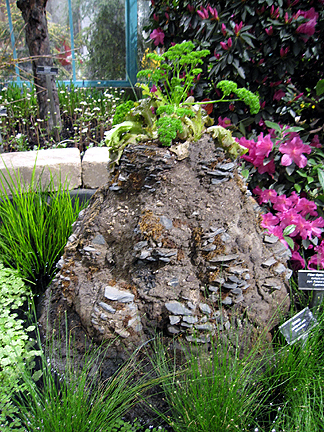 This reminds me a bit of a spiral rock garden I once made under a hemlock. I also love the potager garden, with ornamentals and veggies intermixed. 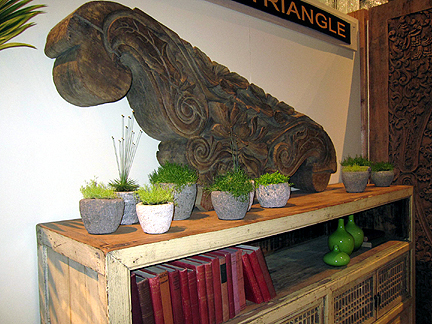 Also loved this artistic combination of lettuce and wheat grass. Was also intrigued by this ingenious lettuce planter--it's pretty but would also keep ground critters out (say, for instance, one rolly polly groundhog) because it's raised and has pokey edges. A pretty combination of hyacinths and a climbing lily (Gloriosa rothschildiana) that Mr. Brown Thumb has named for me 113 times and I've forgotten 112 times! 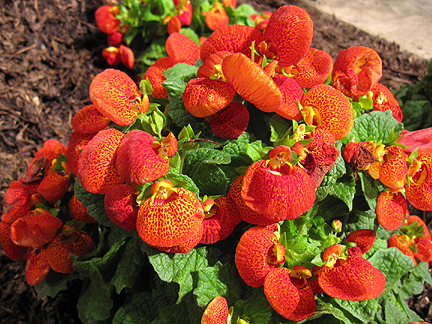 The nice folks from the Chicago Botanic Garden who staffed the answer booth were able to ID this as Calceolaria herbeohybrida (say that three times fast!) for me. As much as I like modern and minimalist design (and that's one heck of a lot, for those keeping score at home), this house struck me, overall, as a bit stark. Loved the orange front door, though. 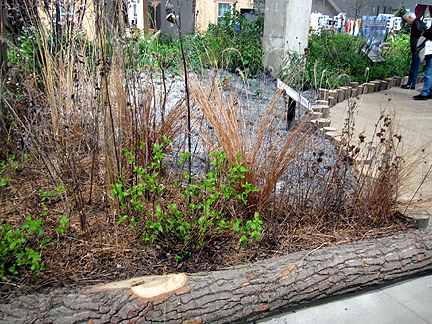 I'm not wild about hardscaping, especially not as edges, but I really liked the use of logs in this display. It has more organic shapes and yet still provides a border. 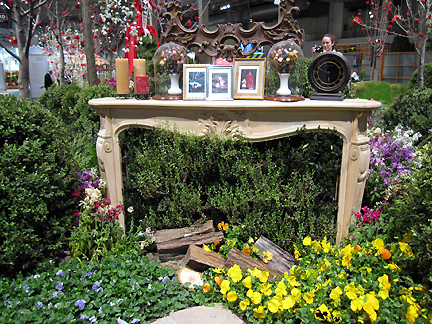 Love this flower fireplace on the edge of the Alice's Wonderland display. The Red Queen was visible just over the fireplace, but she scared me so I cropped her out of the shot. But, look, there's Bintie to the right, taking a photo. Loved this representation of the Cheshire Cat. Alice, don't eat the mushrooms! 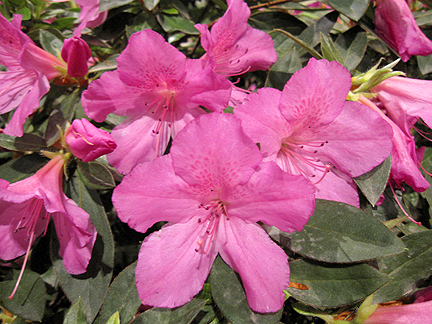 ...to spring displays (locally, Hidden Lake Gardens has an awesome display of azaleas in spring). 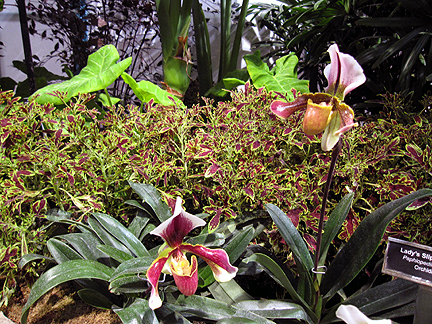 My favorite flower of the show, this sweet, sweet Persian lily (Fritullaria persica). 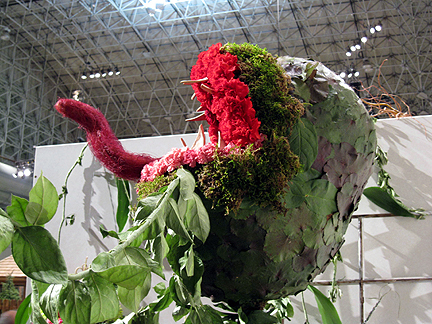 This probably wasn't meant to be a volcano of parsley, but that's how I see it. 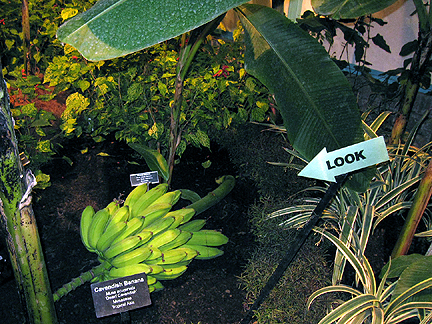 The sign had that Alice in Wonderland theme... Bananas! 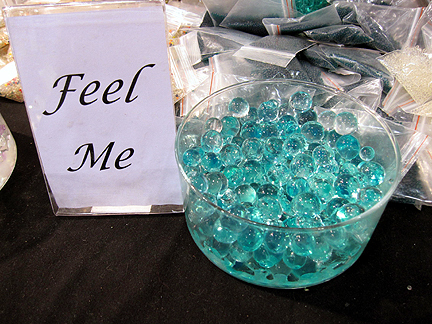 One of the vendors had these cool water-retaining gel spheres that one can use in vases with cut flowers. 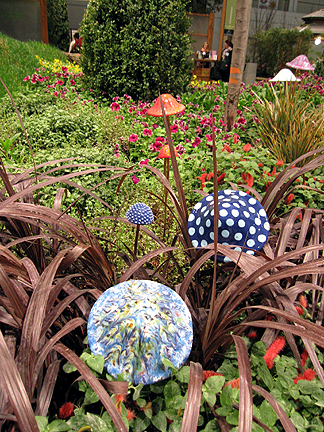 There were lots of pretty colors in lots of bowls... and again, the Alice theme comes into play and touch them I did. Ew!!! So creepy. It felt like slimy eyeballs. Um, not that I've ever felt slimy eyeballs, but it really freaked me out. ...But it was really me who huffed and puffed and bleeeeeeew that straw house down! 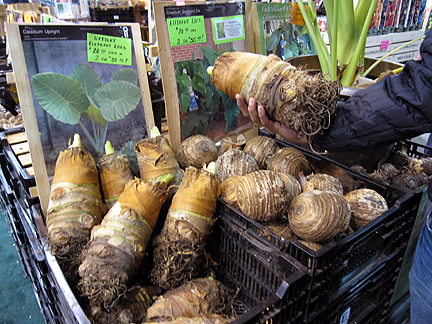 My, what big ears you have... Or, elephant ears on steroids. 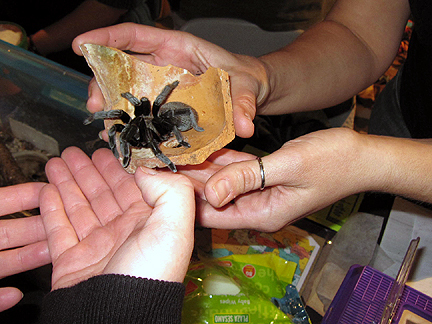 By far, the absolute highlight of the show for me was the "Pet A Bug" exhibit. I did in fact briefly touch the top of a giant cockroach, but admit that was freaky. I wouldn't hold it. The millipedes looked harmless enough. 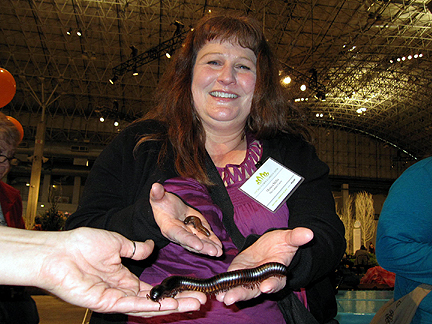 I held the little millipede first, and that was fine. Its feet tickled my hand. The bigger, African millipede was a bit unnerving, due to its hard coat and rigid, pokey legs. I was not unnerved by how the tarantula moved, in fact, very gracefully, I just didn't want to be bitten because I have no health insurance. But look how sweet Tary is. Look at her cool color variegation! Come to mama! I really, really, really wasn't planning to buy anything at the show. But I have a bit of a thing for agaves (waves to Pam), and this super sweet dwarf narrowleaf century plant (Agave striata minima (nana)) from Ted's Greenhouse (which sounds similar to the sadly defunct Farmer Grant's in Ann Arbor) spoke to me (and besides, the nice woman staffing the booth gave me a Peeps!). I even had a retro flowerpot at home, ready and waiting for it. At the Landreth Seeds booth, MBT may have bought some 'Great White' tomato seeds, which could in turn have inspired me to buy some 'Wapsipinicon Peach' tomato seeds (they get fuzz, just like peaches! ), which we possibly split between us. It was a fun day all around! Check back in a few days for my outdoor photos of Chicago! I'm so impressed with your 'stunning' post, Monica. Your photos are amazing and, the tour, delightful. Watching you "Pet A Bug" gave me the willies but, unlike you, I'm a wimp! It was fun. 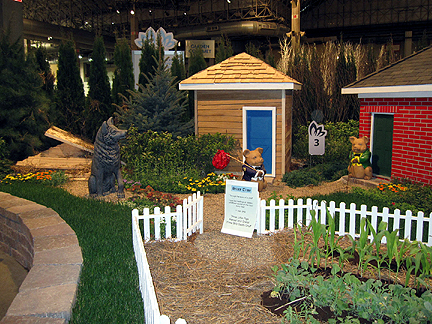 I just did my last post on the show with pics at my "Chicago Garden" blog. You have to come to Chicago more often, I love having someone around who will pose for funny pics. 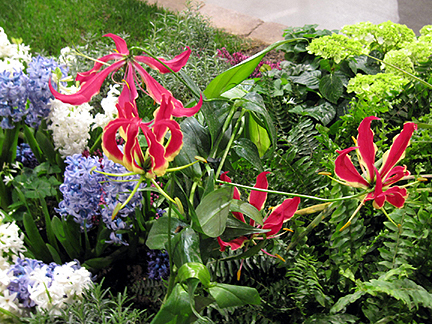 Gloriosa Rothschildiana aka "Climbing Lily." Monica I can tell you had a ball! You took some fab pictures. 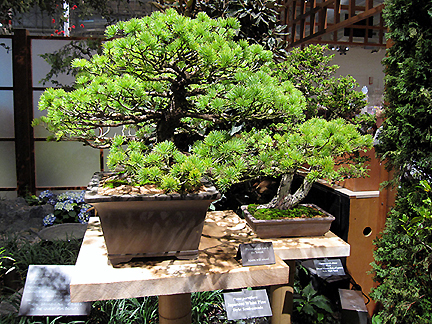 1) The Bonsai Japanese white pine did appear soft.. I like the shape and color, would love to have one. 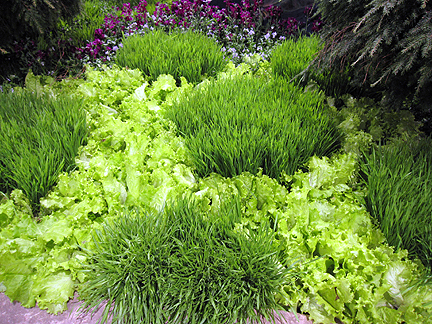 3) lettuce and wheat grass.. What an unusual combo..but nice. 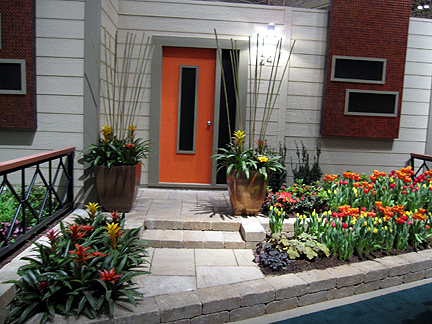 4) The Orange door was cool" it popped against the Hot colored Tulips. You were brave with the Pet bugs" I'm still cringing yikes! What an incredible show! Thanks for sharing it with us! It must have been nice to see all of that color after a long winter. I love the shot of the tulip. It was such fun to see you at the show. It looks like you had a great time. I would have liked the bug display too. 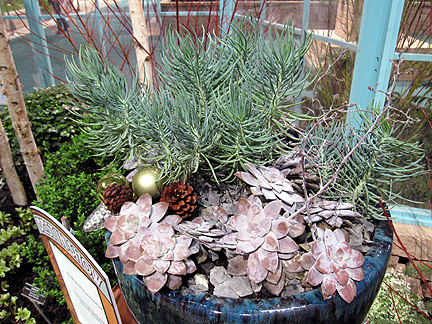 The big pots of succulents was nice too. My little agave has some pups. I will try to remember to bring one to you sometime. Monica, your post says you really enjoyed the show-so did we. So that's a Glorious Roths?? ?, I loved it, too. As well as the Persian Lily. The orange flowers id by the staff were what we always called granny's purses. We missed the bugs-thank goodness-Rose would never have gotten near them. :) Loved all your great photos and narrative. I think it was well worth attending and so glad you had the chance. And likewise, Monica, you did and saw things that we didn't! I can't believe all that we missed! Two days and we were both exhausted. But what fun, and getting to see friends was the best part. Wish you would have been there the same time we were! We just HAVE to get together over the summer! How did I miss those calceolarias?? Wow! It's nice to revisit your parsley volcano again :) I'm still not sorry I missed the tarantula, though. It was so much fun hanging out that day - I look forward to doing it again in Grand Rapids! Looks like fun! I'm not so sure I'd be brave enough to hold the millipede. The tarantula-perhaps. I love that lettuce/grass picture. It's great you could meet Mr. Brownthumb and I do hope Linda gets well soon. Hi Monica. So much to see! 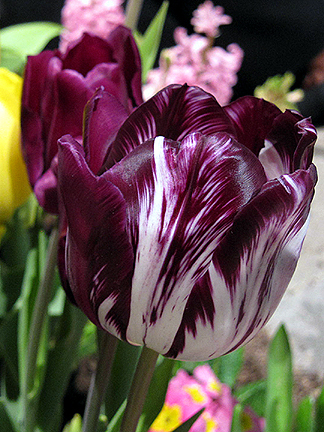 Love the purple and white tulip, the Persian Lily and the cold frame. 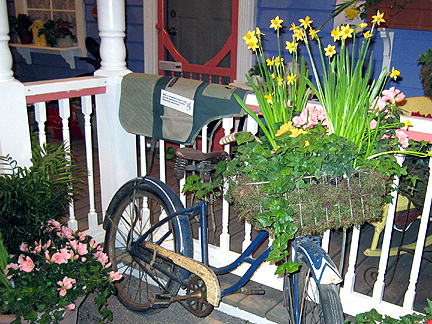 I would have detoured around the creepy crawlies:) I want to put lettuce in my ornamental gardens this year. ich habe mich gerade in Deinen traumhaft schönen Fotos total fest geguckt. Was für eine schöne Garten-Show! So langsam muss es unbedingt Frühling werden. Lotsa great photos Monica! I'm sorry to miss hanging out with you all, but relieved whatever that bug was, it was short-lived and I got to go to the show later. I totally missed the "Pet a Bug" display - I totally would have held some of those critters. I would have drawn the line at giant slugs though. It was great having you, and I hope you didn't get any of my germs. Looks like you had a lot of fun. 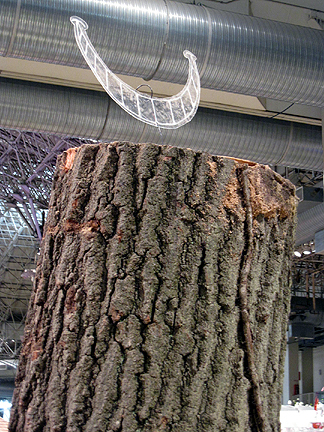 I'm glad you got a good shot of that spray-painted, crystal-dripping dead tree. I thought it was wonderful. 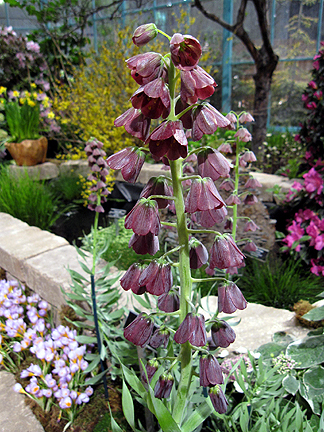 I also admired the Fritillaria, but knew it wouldn't turn out with my camera. 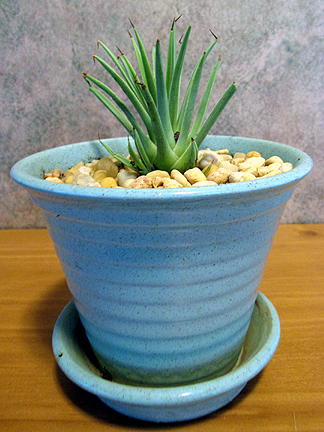 Ooh, love your baby agave and its pot! That was a real interesting post. I liked a lot of the displays that you liked. The potagers were cool. And your macro shot of the tulip did indeed turn out great. Wow interesting to visit the show with you, great fun! it's the mice's turn next week, we volunteer at the SF show and will tour and no doubt post some pics. I love the pet a bug thing, that would challenge me! But what dismays me is how in America people can be without health care. it really bums me out. My daughter is in the same boat, self employed, pre-existing condition - uninsurable. Sorry you bumped into a sore spot with me. But I loved your show pics for sure. Thanks for taking us all to the show. 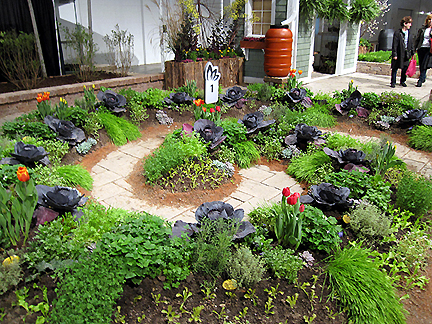 I do like that spiral garden. PS my word verification thing is "poodinim" LOL-- Sorry I just thought that was funny. Monica Loved seeing all these exhibits! NO NOT the EEK..creepy specimens!! 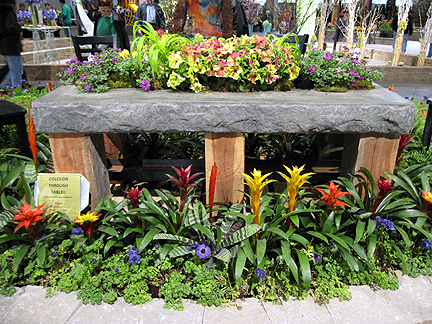 Nice that you had met up with a few of your garden blogger friends! 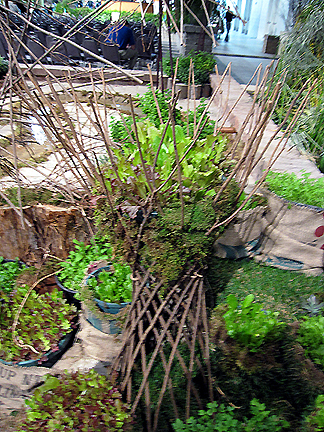 Loved so many of the exhibits..can't pick a fav..but it was the lettuce patch on sticks!!! now I must rest my wrist! 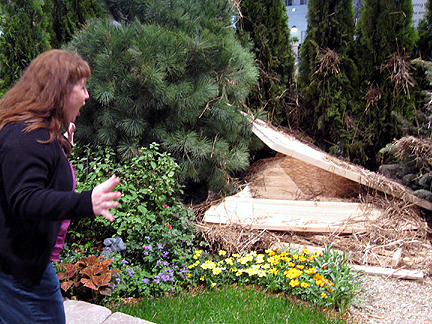 Oh' what a wonderful garden show! Wish I can also there, to see it personally. Anyway, I enjoyed reading it. Thanks for sharing. love the bonsai. wish i could have them at my house. nice place to visit, wish i could go there and take some pictures. that would be so much fun.